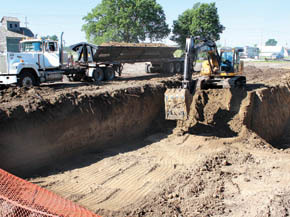 Excavation was underway last week for the diving bowl for the new Albion Swimming Pool. Thousands of cubic yards of dirt were being hauled out of Fuller Park to create the space for the new pool. Excavation was continuing this week for various portions of the pool complex. Christiansen Construction of Pender holds contracts for both the pool vessel and general construction, which includes all structures. The goal is to have the pool in operation next summer.